The Painting Workstation Easel offers artists in wheelchairs a thoughtfully designed, completely integrated workstation where they can paint comfortably. It’s just as handy for artists who prefer to work sitting down and is ideal for both oil and watercolor painting. The easel can be adjusted vertically or horizontally, and slanted forward up to 10°. Two side-pivoting supports and a variety of vertical and horizontal drawers accommodate painting supplies and storage. 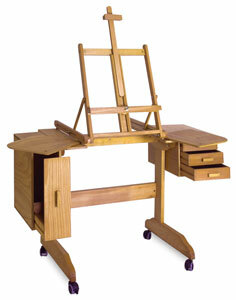 The Painting Workstation is constructed of oiled, stain-resistant beechwood. Simple assembly is required.